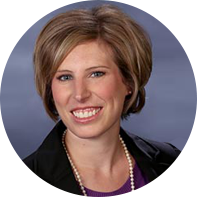 Dr. Jessica Schrieber recently returned to her hometown to join Medical Eye Associates. She is on staff at Waukesha Memorial Hospital, Oconomowoc Memorial Hospital, as well as the Eye Surgery and Laser Center in Wauwatosa. She sees patients at the Waukesha, Mukwonago and Oconomowoc Offices. She accepts new patients of all ages, including those with glaucoma and cataracts. Dr. Schrieber grew up in Brookfield. She earned an undergraduate degree in Biochemistry and Molecular Genetics from Gustavus Adolphus College in Saint Peter, Minnesota. After completing a post-Baccalaureate research fellowship with the National Institute on Aging in Baltimore, Maryland. Dr. Schrieber earned her Medical Degree from the University of Wisconsin School of Medicine and Public Health. She completed her Internship and Ophthalmology Residency at William Beaumont Hospital in Royal Oak, Michigan. She furthered her training in medical and surgical glaucoma with a fellowship at the Cincinnati Eye Institute. In her free time, Dr. Schrieber enjoys golf, music, staying active, spending time with her family and friends, and cheering for Wisconsin sports teams.